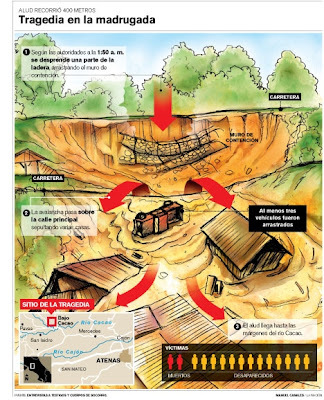 For those of you curious about the landslide in Atenas, Costa Rica, I found this published in La Nacion on Friday, October 12, 2007. The graphic has a map inset in the lower left showing the area of the mudslide. The location of the tragedy is in Fatima de Bajos Cacao, located to the west of our place in El Cajon de Atenas. Today's reports indicate 10 bodies have been recovered and 4 are still missing. Here is a link to a large scale topographical map of the Atenas Canton located in the Alajuela Provence.